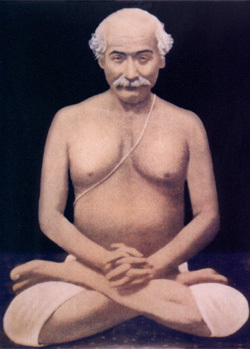 Lahiri Mahasaya (1828 â&#128;’ 1898) was one of India’s foremost Spiritual Masters. His original family name was Shyama Lahiri. Mahasaya is an honorary Sanskrit prefix meaning magnanimous one. Up until the age of 33 Lahiri Mahasaya lived an ordinary worldly life. However circumstances took his job to the foothills of the Himalayas. It was here that he had a remarkable meeting with the avatar Babaji. Babaji was able to rekindle Lahiri Mahasaya’s spiritual realisations. Realisations he had attained in previous lifetimes. After experiencing the bliss of Samadhi in the Himalayan Mountains. His Guru directed Lahiri Mahasaya to return to his worldly life and teach the ancient art of Kriya Yoga. During his lifetime he initiated many seekers from different faiths into the ancient Indian art of Kriya Yoga. In particular he was willing to break down the rigid caste barriers that were present at the time. Lahiri Mahasaya saw God everywhere and was unencumbered by social status. Towards the end of his life his aura of spirituality and peace attracted many sincere seekers who would come to meditate in his presence. However Lahiri Mahasaya only became well known through Paramahansa Yogananda’sAutobiography of a Yogi. Yogananda was a disciple of Sri Yukteswar, and Sri Yukteswar was himself a direct disciple of Lahiri Mahasaya. Thus the Kriya Yoga tradition that has spread around the world, including the West can be traced back to Lahiri Mahasaya and the great Avatar Babaji. On one occasion in Benares, the great Indian sage Trailanga Swami, who was known to be nearly 300 years old, forsook his usual silence in order to pay public honor to Lahiri Mahasaya. One of Trailanga’s disciples objected. “Sir”, he said, “why do you, a Swami and a renunciant, show such respect to a mere householder?”.